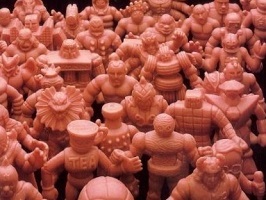 This week I’d like to share a figure that is not a M.U.S.C.L.E. at all – Prism. That’s not technically correct. He is one of the Non-Poster figures that make up the Magnificent 11. 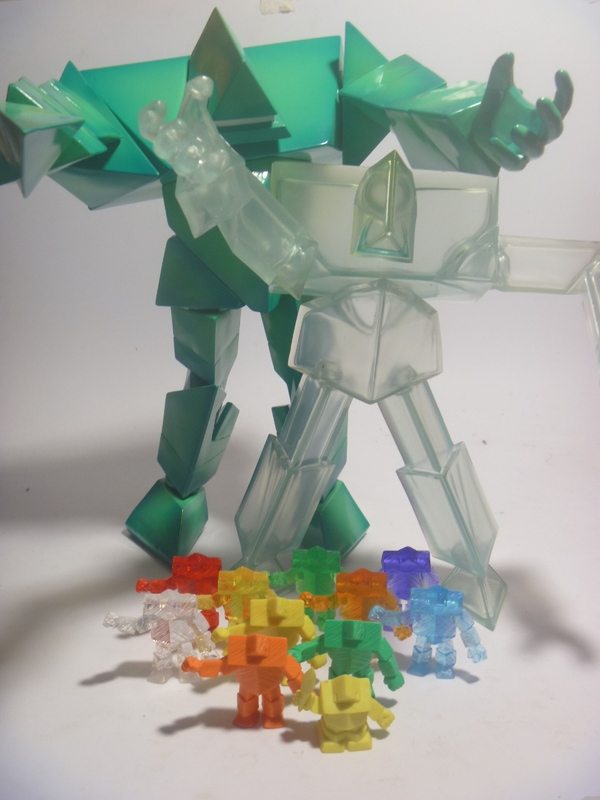 If I had my choice as to which figure I’d want from that Magnificent 11, then Prismman would be it. He’s a block of ice and the figure actually has a texture like ice. 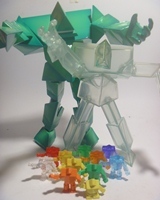 Sadly, that is missing from the clear, ice-like colored Romando figure (if ice even has a color). That is what attracted me to the ice-like custom figure; it really suits the theme and is why I bought the figure. This lot of seven custom figures was one of my favorite purchases on eBay this past year. 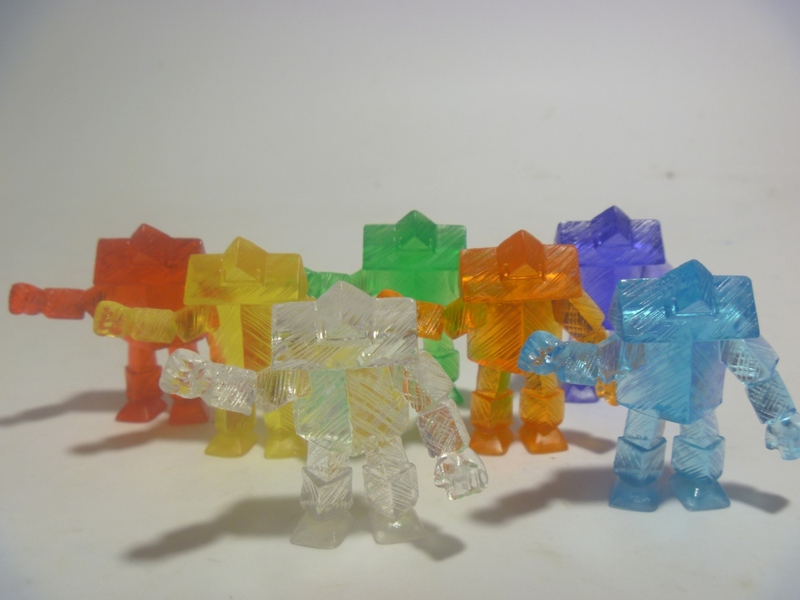 It just so happened that there were six other semi-transparent Prismman figures in the lot. I also really like the other Romando figure, mainly because his coloring is similar to the Miami Dolphins (my favorite NFL team) and the fact that he is huge. There is a blue version like it but I am satisfied with the teal one…for now. 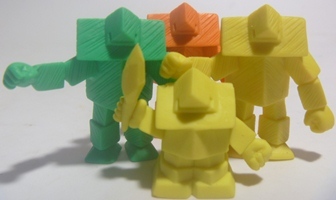 My Prismman collection is made up of the Kinkeshi Part 28 (not overly easy to find), the SD Kinkeshi holding his shard of ice as a weapon (also not easy to find), the two Romando’s, and the custom lot I bought. I wish there was more – it’s one of those figures you’d love to own more of simply because it’s attractive. 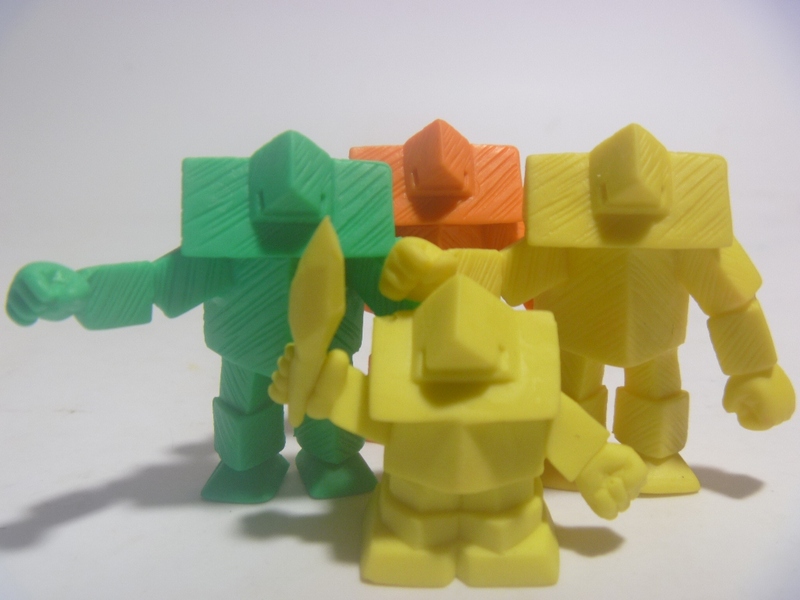 I should mention that is another sculpt for Prismman in the Kinkeshi line – problem is that I hate it, absolutely hate it. It has points at the end of his arms and legs, making it impossible to stand on its own and it’s not even in a pose. I just can’t do anything with it so I refuse to own it. I don’t even have a picture to show you how bad it really is…but you don’t want to see it. Trust me. This entry was posted on Monday, April 7th, 2014 and is filed under UofM News. You can follow any responses to this entry through RSS 2.0. You can skip to the end and leave a response. Pinging is currently not allowed. Something like that should always be embedded; not just linked.